R.K.O Pictures studio calls me! Surprise, surprise surprise! Never have I worked at that studio before and now all of a sudden they want me for a role in a Leon Errol comedy-short. Imagine, and with my favorite comedian. I'm very thrilled and happy -- but certainly can't understand how this came about. George Bilson, the producer, said he's been wanting me for quite a while too. My role is that of a legitimate heavy "ex-convict gangster" -- imagine again. And the "bit" was a one-day $100 job -- but upon discovering a twisted schedule he hinted and tactfully suggested the role could go two days but at $75 per. What was I to argue about? I agreed -- and was fitted at their wardrobe and passed on by the front casting office, by the director Charles Roberts & by George Bilson. My first role at R.K.O. Radio Picture studio had me report at 11 A.M. but I came early and watched intently & avidly one of the greatest of comedians, almost like a student. Then came my turn, and the precise timing that Leon Errol demands I gave -- and felt very confident because of this. I, too, demand precise timing, to the best of my ability. 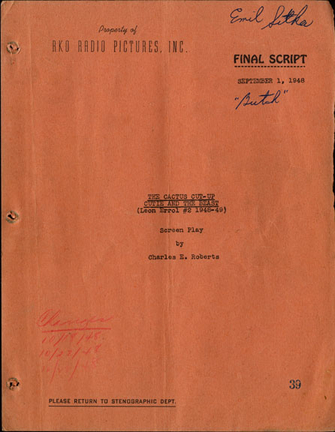 And so, costumed & made-up like a hardened tough (heavy) gangster I received my meager "professional" suggestions from the director Chuck Roberts and proceeded assuredly and, as George Bilson complimented me, "cooperatively and very ably" to do my acting with Errol, the star. My timing surprised Errol, for he very apparently doesn't know anything about my work, and one single "take" for all -- dialogue, angles, and even a fight scene -- went off perfectly. I was glad and very thrilled to hear the producer commend me for making it "look so good." He promised to use me again, & soon! Early at RKO Radio studio -- even before the hour I was scheduled for -- they called me first. They shot a close-up of my foot stepping on a ketchup bottle for the fight scene we did yesterday with Leon Errol in this comedy-short called "Cactus Cut Up." Then all day, I was fortunate enough to watch and study the art & perfect timing of that master comedian -- until my scenes again. Except for the director's change of one turn, all the scenes I performed in were "one-takes." Then I noticed that when all was done, & Errol shook hands, the "still" photographer wanted but couldn't get one "still" with me. So I suggested to Errol the man's desire & one was snapped. A copy with him I'd like. Emil obviously had a lot of respect for Leon Errol, with whom he had worked once before, about a year earlier, in the Monogram feature FIGHTING MAD (1948), a "Joe Palooka" movie starring Joe Kirkwood, Jr.
CACTUS CUT-UP was one in a long series of Leon Errol shorts produced by RKO Radio Pictures in the 1940's. Errol made several two-reelers for Columbia in the early 1930's but reportedly quit after an argument with a studio executive. 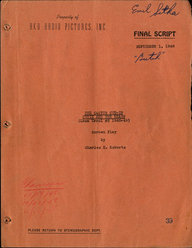 Written and directed by Charles Roberts, CACTUS CUT-UP features a cast that includes Dorothy Granger, Noel Neill, Roland Morris, Ralph Peters, Harry Brown, Robert Bray and Jack Rice. In the story, Errol's wife and daughter arrange an elaborate hoax staged in an old Western-styled saloon during which Errol is to be framed for shooting a man. Yes, it's contrived, but aren't they all? At the height of the farce, just as an angry mob is putting a hangman's noose over Errol's head, a terrible coincidence occurs. 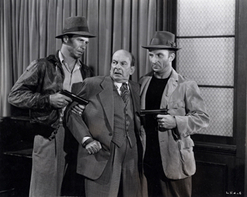 Two escaped criminals, "Moxie" and "Butch" (played by Emil), come in to hold up the saloon at gunpoint, walking right into the middle of the hoax. In dramatic action uncharacteristic of a two-reel comedy, Emil gets into a serous fistfight and gunshots are exchanged, but the police show up just in time to assure a happy ending. Although Emil describes his role as a "legitimate heavy ex-con gangster," he has one bit of slap-stick that almost completely un-does the serious image. As he takes a hostage and begins to walk backwards out of the saloon, he step upon the aforementioned ketchup bottle and does such a humorous backwards pratfall, it's hard to take this "hardened tough gangster" seriously afterward. Dorothy Granger, who plays Errol's wife, enacted this same role in many RKO shorts. She appeared in quite a few Columbia comedies as well, including PUNCH DRUNKS (1934) and TERMITES OF 1938 (1938) with the Three Stooges and HOT HEIR (1947) with Hugh Herbert. She also appeared with many of the studio's other comedians such as Andy Clyde, Vera Vague, Schilling & Lane, Joe DeRita and others. Noel Neill portrays Errol's daughter in CACTUS CUT-UP, just about the same time she appeared as Superman's "Lois Lane" in feature films starring Kirk Alyn. Of course, she became famous a few years later as "Lois Lane" in the television series ADVENTURES OF SUPERMAN (1953-1957) starring George Reeves. Emil went on to appear in seven RKO comedy shorts, including one more with Leon Errol called PUNCHY PANCHO (1951).